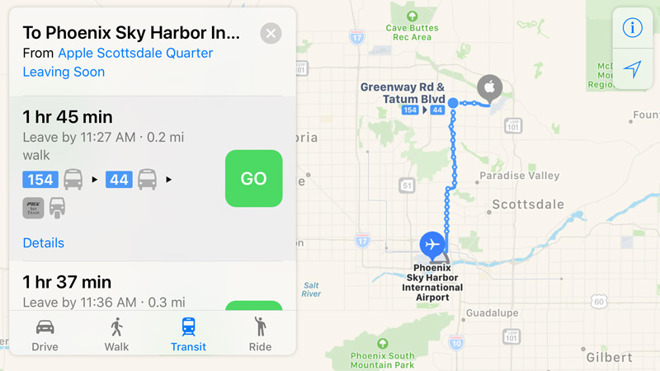 Apple has silently updated its Maps coverage with public transit directions for Phoenix, Ariz., filling in another major U.S. city. People with an iPhone, iPad, Mac, or Apple Watch can get around by bus and train within the city itself, as well as various suburbs like Mesa, Scottsdale, and Tempe. Apple's Mesa data center, however, is out of range. Phoenix isn't yet listed on Apple's iOS feature availability page, which the company is typically slow to update. Apple continues to concentrate most of its Maps transit coverage in the U.S., U.K., China, and Japan. Some other American cities in the mix include Austin, Chicago, Denver, Los Angeles, New York City, San Francisco, and Washington D.C. Most countries still lack transit directions, and those that do have them are sometimes limited to a single city —some examples being Germany, Hungary, Mexico, and the Czech Republic.